HandySet Technical combines a portable colour test monitor with an on screen display of the Sync Pulse, Chroma Burst and Video levels as well as the internal battery voltage. The on-screen display, which may be turned on or off, is easy to read and provides enormous benefits to the CCTV engineer. Whether the application be commissioning, service or fault finding, the Technical HandySet is sure to become an invaluable tool. With a 4” LCD colour display, rechargeable battery, robust controls and connectors all housed in a tough leather case with unique hands free operation, the HS101 standard test monitor is the same specification as the HandySet Technical but without the additional inbuilt test functions. 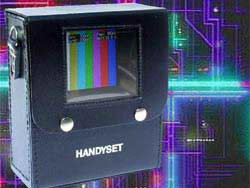 The HandySet Standard is available in either PAL (CCIR) or NTSC (EIA) versions. The HandySet Technical is only currently available in PAL (CCIR) version. Following requests from the users of HandySet units, we have now produced a clip on sun shield that protects the HandySet display from sunlight. The Sun Shield clips onto the HandySet leather case in place of the viewing window flap. Made from real leather, the sun shield comprises a rectangular tube, 150mm long that almost completely alleviates reflection on the screen. Also available optional 12v dc car charger lead.